Apricot Sunrise has a tidy, upright growth habit and soft, gray-green leaves with a wonderful minty-licorice aroma when crushed. It grows to between 18-24" tall and spreads by rhizomes (underground stems) to form a plant that's about 18-24" wide. 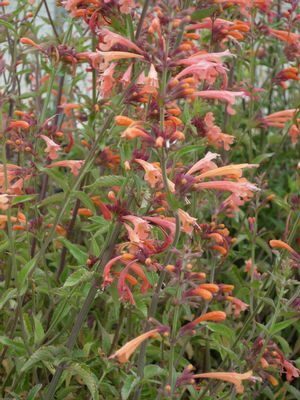 The tubular orange-apricot flowers bloom non-stop from summer through early fall and attract a never-ending array of hummingbirds, butterflies and bees. Aromatic foliage; smells like a wonderful fresh blend of mint and aniseed. The flowers are a magnet for hummingbirds. Plant Apricot Sunrise in a sunny location where it'll get sun for at least half the day. Apricot Sunrise is cold tolerant down to 10°F. Agastaches can handle moist soil, but need good drainage; they won't tolerate being in waterlogged soils. They bloom for longer in the summer with occasional watering; perhaps once every 2-3 weeks on the coast and once every 1-2 weeks in hotter inland areas. Great as a cut flower. Agastaches can start to look untidy after they've finished blooming. When this happens, cut the whole plant back to the ground. New shoots will start to grow back in spring.